Came across the discharge of Morgan Meeks among the Republic of Texas claims at the archive. He served from July 12 to October 12, 1841 in Company D, Captain William M. Williams’ Volunteers. The claim, payment of $75, was paid June 18, 1852. This is to certify that Morgan Meeks substitute for Squire Mays a private soldier in my company of volunteers has faithfully discharged all the duties required of him as such for three months next preceeding the date hereof and is this day honorably discharged. The Hays County Historical Commission updated their website to include the comprehensive cemetery inscription list which previously resided on the county website. It makes sense to put this information alongside the history, old photographs and bits of ephemera pertaining to the county’s history. Now there is a brief history of each cemetery along with some photos to complement the listing. Overall, very nice, but there is some error in the history of the Butler Cemetery. Most notably, the references to the Heeks family should read Meeks. Since I have a little information on this family, I thought I would share. As always, this is a combination of public records research, afternoon library lounging, daydreaming, speculating and burning up the wires with other genealogy/history/library geeks. You must take me as you find me. Ain’t history fun? In 1850, a large group of extended family from Missouri and Arkansas settled in Travis County and Hays County, Texas. It included Suddeth (possibly, Suddeth would have reached 70 years of age in 1849) and Winnie (y) Ann Meeks, some of their children and their children’s families. I have no way of knowing but I suspect they were prompted to seek less crowded conditions in Texas after a drought and a terrible cholera epidemic in 1849. At least two of their children preceded them to Texas. It is possible that this is something they were already considering and conditions in 1849 sealed the deal. The oldest daughter, Lucy, was married to Reece Butler. Younger sisters Nancy and Elizabeth were married to brothers, Dan and John Mayes. The association of the Meeks, Butler and Mayes families goes back to Arkansas Territory days. Elizabeth Meeks Mayes, husband John Mayes and at least six children, lived in the Onion Creek and Wimberley areas. I suspect there are more and that not all their children survived to make the trip to Texas. In 1850, Lucy would have been 46 years old and (I suspect) past her childbearing years. That is, I haven’t found any children born in Texas. Reece would have been 44. John, Sarah and Lizzie are buried in the cemetery with their parents. The following is a tale describing Reece Butler from “Tales of Old-Time Texas” by Frank Dobie. The Indian who as a favor tells a secret of hidden gold is not obligated to prove anything. I’m not either. In 1941 I helped Mr. J. D. Talley celebrate his eighty-eighth birthday, in Austin, Texas. He was a refined old gentleman of marked neatness and did not look or talk as a cowboy who had ridden the open range and trailed longhorn herds to the wild cow-towns of Kansas is supposed to look and talk. That evening he told this tale. When his people moved to Hays County – the county of the beautiful San Marcos River – in 1870, they became neighbors to an odd character named Reece butler who had been on the frontier a long time. He had a few cattle, farmed a little, hunted whenever he wanted to, was a blacksmith, carpenter, and furniture-maker and could do anything. He made a wagon out of bois d’arc wood he got up on Red River. He made fiddle keys out of the wood of Mexican persimmon. He mad charcoal for the forge in his blacksmith shop out of mesquite wood. He claimed that mesquite charcoal produces a hotter fire than cedar charcoal, which is more commonly used. He made crucibles from clay found on the Colorado River near Austin. Reece Butler had fought the Indians, but he had also been friendly to some of them, and one time an Indian whose life he had saved guided him to a deposit of silver and gold ore somewhere in the Llano River country – where the Lost San Saba Mine is sometimes placed by hunters who can’t find it on the San Saba. About once a year Reece Butler would yoke six oxen to his homemade bois d’arc wagon and pull out alone. A month or so later he would come back with a heavy load of black-looking ore. What he did with it was no secret, but the place where he got it was. One time a man tried to follow him; the man did not come back. He would unload the ore at his blacksmith shop, pound it into small pieces no bigger than acorns, place them in one of his clay crucibles and then use his bellows and mesquite charcoal to melt the metal. The extract from a wagon load of ore would amount to a hunk about as big as Reece Butler’s two burly fists. It was mostly silver, but anybody could see streaks of gold in it. This hunk of gold-tinged silver he would take to Austin and sell to a jeweler named Bahn. In the course of nature Reece Butler died, and with him died all knowledge of the ore deposit shown by one Indian to one white man. Nancy, born 23 Dec 1848, married Eli Hill. I can confirm that seven of their children made it as far as Texas. Dan seems to be the only one buried in the Butler Cemetery. I believe he died about 1867. Nancy died sometime after 1880. There is a story circulating among researchers and passed along to me by Linda M. that Dan Mayes was murdered by one Michael Sessom, an early settler of San Marcos, in revenge for Mayes turning in his son David. David Sessom served in the Confederate Army and was accused of spying for the Union. He was subsequently hung for treason. Some thought Dan Mayes the victim of an Indian attack when he was later found dead. However, descendants tell a story of Michael Sessom’s death bed confession. On an interesting note, David Sessom’s widow was Mary Meeks, daughter of Dan’s brother-in-law Merritt. Before the state library closed the genealogy room for remodelling last year, I looked into this a little bit. I found David Sessom’s military record which was brief and of little interest. I checked the Hays County tax records for the 1860’s. Dan Mayes is listed as paying his taxes through 1867. In 1868, his son John paid his father’s taxes. There is no record after that and the stone in the cemetery has only his name. The Merritt Meeks family and their widowed daughter Mary had relocated to Collin County by the time of the 1870 census. My gut instinct tells me that there is at least some truth to this story. There were many people in central Texas during the war that were lynched for their pro-union sentiments. I think maybe something like this happened, rather than some sort of offical action such as a court martial. I’ve discovered six of their children in local records. They first made their home in the Onion Creek area and then moved to Wimberley in 1857. Elizabeth died about 1860. John married Elizabeth Jane McGuire in 1870 and later moved to Llano where they show up on the census in 1880. I wonder if John knew anything about his brother-in-law’s interest in the Llano area? John fathered two more children with his second wife, Emma and Missouri. Missouri Mayes died at the age of twelve and is buried in the Walnut Creek Cemetery in Blanco County. There has been controversy over access to the cemetery over the years. 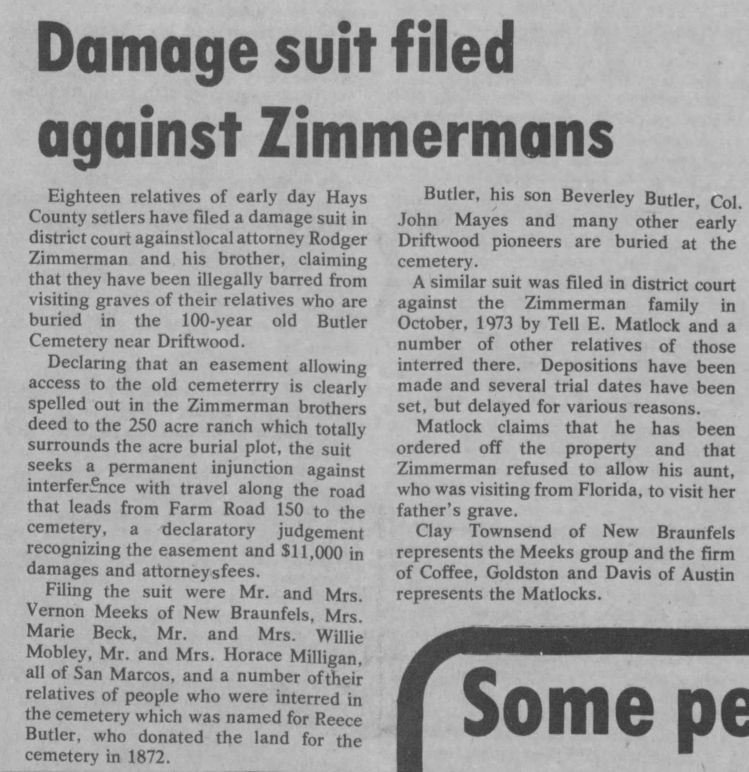 This article is clipped from page 6 of the November 21, 1974 issue of the Hays County Citizen. Balancing the rights of landowners vs. descendants is a complicated and on-going issue. What interested me is the reference to “Col. John Mayes” and I’m not sure to whom that refers. John, son of Daniel, is buried in Blanco County. There is a John D. listed in the inscriptions but he is too young to have been the son of John Sr. Ah, I have much work to do. My wish is to find this list of people interred in unmarked graves of which I have heard rumor. Anyone know anything of it?